This study investigated the antidiabetic activity of Cinnamomum cassia (C. cassia, Cc) silver nanoparticles (CcAgNPS) and effects of C. cassia on the kidneys of rats with induced type 2 diabetes. Twenty-four Sprague-Dawley rats weighing 250 ± 20 g were induced with diabetes by intraperitoneal injection of streptozotocin (STZ, 60 mg/kg). Animals were randomly assigned to one of four groups (n = 6) and treated for eight weeks with normal saline (control, group A), 5 mg/kg of CcAgNPs (group B), 10 mg/kg of CcAgNPs (group C), or 200 mg/kg of Cc (group D). Body weight and fasting blood glucose (FBG) was measured weekly and fortnightly, respectively. At the end of experiments animals were euthanized, blood and kidney tissue samples were collected for biochemistry (oxidative stress markers and renal function parameters) and kidneys were harvested for histology (PAS and H&E staining). Body weight was significantly higher in group B and C vs. control (p < 0.05), while no significant differences were observed in the kidney-to-body weight ratio between groups. FBG, glutathione, malondialdehyde, alanine aminotransferase, aspartate aminotransferase, serum urea and creatinine were significantly lower in group B, C and/or D vs. control (all p < 0.05). In group A, severe distortion of the glomerular network was observed, marked by the loss of capsular integrity, thickened basement membrane, tubular cells with pyknotic nuclei, vacuolization, and interstitial space with infiltrations. These adverse effects were mitigated by 5 mg/kg and 10 mg/kg of CcAgNPs. Our study confirms structural and functional damage to kidneys caused by diabetes. CcAgNPs have a regenerative potential in diabetes-induced kidney damage and may be used as an antidiabetic agent. Organization WH. Global report on diabetes: World Health Organization; 2016. Subramoniam A. Plants with anti-diabetes mellitus properties: CRC Press; 2016. Satyanarayana T, Katyayani B, Latha HE, Mathews AA, Chinna EM. Hypoglycemic and antihyperglycemic effect of alcoholic extract of Euphorbia leucophylla and its fractions in normal and in alloxan induced diabetic rats. Pharmacognosy Magazine. 2006;2(8):244. Zhou X, Wang B, Zhu L, Hao S. A novel improved therapy strategy for diabetic nephropathy: targeting AGEs. Organogenesis. 2012;8(1):18-21. Mieszawska AJ, Mulder WJ, Fayad ZA, Cormode DP. Multifunctional gold nanoparticles for diagnosis and therapy of disease. Molecular pharmaceutics. 2013;10(3):831-47. Lee H-S. Inhibitory activity of Cinnamomum cassia bark-derived component against rat lens aldose reductase. J Pharm Pharm Sci. 2002;5(3):226-30. Sulaiman F, Akanji M, Oloyede H, Sulaiman A, Olatunde A, Joel E, et al. Oral Exposure to Silver/Gold Nanoparticles: Status of Rat Lipid Profile, Serum Metabolites and Tissue Morphology. Journal of Medical Sciences. 2015;15(2):71. Zhang X-F, Choi Y-J, Han JW, Kim E, Park JH, Gurunathan S, et al. Differential nanoreprotoxicity of silver nanoparticles in male somatic cells and spermatogonial stem cells. International journal of nanomedicine. 2015;10:1335. Panyam J, Labhasetwar V. Biodegradable nanoparticles for drug and gene delivery to cells and tissue. Advanced drug delivery reviews. 2003;55(3):329-47. Chen X, Schluesener H. Nanosilver: a nanoproduct in medical application. Toxicology letters. 2008;176(1):1-12. Awazu K, Fujimaki M, Rockstuhl C, Tominaga J, Murakami H, Ohki Y, et al. A plasmonic photocatalyst consisting of silver nanoparticles embedded in titanium dioxide. Journal of the American Chemical Society. 2008;130(5):1676-80. Ansari S, Farha Islam M. Influence of nanotechnology on herbal drugs: A Review. Journal of advanced pharmaceutical technology & research. 2012;3(3):142. Ranasinghe P, Pigera S, Premakumara GS, Galappaththy P, Constantine GR, Katulanda P. Medicinal properties of ‘true’cinnamon (Cinnamomum zeylanicum): a systematic review. BMC complementary and alternative medicine. 2013;13(1):275. Bandara T, Uluwaduge I, Jansz E. Bioactivity of cinnamon with special emphasis on diabetes mellitus: a review. International journal of food sciences and nutrition. 2012;63(3):380-6. Malviya N, Jain S, Malviya S. Antidiabetic potential of medicinal plants. Acta Pol Pharm. 2010;67(2):113-8. Shankar T, Karthiga P, Swarnalatha K, Rajkumar K. Green synthesis of silver nanoparticles using Capsicum frutescence and its intensified activity against E. coli. Resource-Efficient Technologies. 2017. Daisy P, Saipriya K. Biochemical analysis of Cassia fistula aqueous extract and phytochemically synthesized gold nanoparticles as hypoglycemic treatment for diabetes mellitus. International journal of nanomedicine. 2012;7:1189. BarathManiKanth S, Kalishwaralal K, Sriram M, Pandian SRK, Youn H-s, Eom S, et al. 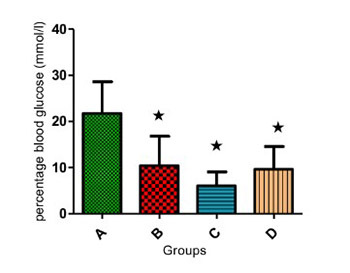 Anti-oxidant effect of gold nanoparticles restrains hyperglycemic conditions in diabetic mice. Journal of nanobiotechnology. 2010;8(1):16. Latendresse JR, Warbrittion AR, Jonassen H, Creasy DM. Fixation of testes and eyes using a modified Davidson's fluid: comparison with Bouin's fluid and conventional Davidson's fluid. Toxicologic pathology. 2002;30(4):524-33. Gundersen H, Jensen E. The efficiency of systematic sampling in stereology and its prediction. Journal of microscopy. 1987;147(3):229-63. Kent Christensen A, Peacock KC. Increase in Leydig cell number in testes of adult rats treated chronically with an excess of human chorionic gonadotropin. Biology of reproduction. 1980;22(2):383-91. Skov K, Mulvany M, Korsgaard N. Morphology of renal afferent arterioles in spontaneously hypertensive rats. Hypertension. 1992;20(6):821-7. Ogedengbe OO, Jegede AI, Onanuga IO, Offor U, Naidu EC, Peter AI, et al. Coconut Oil Extract Mitigates Testicular Injury Following Adjuvant Treatment with Antiretroviral Drugs. Toxicological research. 2016;32(4):317. Abou-Seif MA, Youssef A-A. Evaluation of some biochemical changes in diabetic patients. Clinica Chimica Acta. 2004;346(2):161-70. Arkkila PE, Koskinen PJ, Kantola IM, Rönnemaa T, Seppänen E, Viikari JS. Diabetic complications are associated with liver enzyme activities in people with type 1 diabetes. Diabetes Research and Clinical Practice. 2001;52(2):113-8. Ramesh B, Viswanathan P, Pugalendi KV. Protective effect of Umbelliferone on membranous fatty acid composition in streptozotocin-induced diabetic rats. European journal of pharmacology. 2007;566(1):231-9. Budin SB, Ismail H, Chong PL. Psidium guajava fruit peel extract reduces oxidative stress of pancreas in streptozotocin-induced diabetic rats. Sains Malaysiana. 2013;42(6):707-13. Shirwaikar A, Rajendran K, Barik R. Effect of aqueous bark extract of Garuga pinnata Roxb. in streptozotocin-nicotinamide induced type-II diabetes mellitus. Journal of ethnopharmacology. 2006;107(2):285-90. Hakim ZS, Patel BK, Goyal RK. Effects of chronic ramipril treatment in streptozotocin-induced diabetic rats. Indian journal of physiology and pharmacology. 1997;41:353-60. Al-Quraishy S, Dkhil MA, Moneim AEA. Anti-hyperglycemic activity of selenium nanoparticles in streptozotocin-induced diabetic rats. International journal of nanomedicine. 2015;10:6741. Whitton PD, Hems DA. Glycogen synthesis in the perfused liver of streptozotocin-diabetic rats. Biochemical Journal. 1975;150(2):153-65. Hassan Z, Ahmad MAAM, Naidu SR, Kumar G, Umachigi SP. Hypoglycaemic effects of aqueous extract of Gynura procumbens. Pharmacologyonline. 2008;1:30-50. Hassan Z, Yam MF, Ahmad M, Yusof APM. Antidiabetic properties and mechanism of action of Gynura procumbens water extract in streptozotocin-induced diabetic rats. Molecules. 2010;15(12):9008-23. Zafar M, Naqvi S, Ahmed M, Kaimkhani ZA. Altered kidney morphology and enzymes in streptozotocin induced diabetic rats. Int J Morphol. 2009;27(3):783-90. Malatiali S, Francis I, Barac-Nieto M. Phlorizin prevents glomerular hyperfiltration but not hypertrophy in diabetic rats. Experimental diabetes research. 2008;2008. Adeyemi OS, Sulaiman FA. Biochemical and morphological changes in Trypanosoma brucei brucei-infected rats treated with homidium chloride and diminazene aceturate. Journal of basic and clinical physiology and pharmacology. 2012;23(4):179-83. Adeyemi OS, Akanji MA. Psidium guajava leaf extract: effects on rat serum homeostasis and tissue morphology. Comparative Clinical Pathology. 2012;21(4):401-7. Nabi SA, Kasetti RB, Sirasanagandla S, Tilak TK, Kumar MVJ, Rao CA. Antidiabetic and antihyperlipidemic activity of Piper longum root aqueous extract in STZ induced diabetic rats. BMC complementary and alternative medicine. 2013;13(1):37. Li B, Wang Z, Fang J-J, Xu C-Y, Chen W-X. Evaluation of prognostic markers in severe drug-induced liver disease. World journal of gastroenterology: WJG. 2007;13(4):628. Concepción NM, Pilar MM, Martin A, Jimenez J, Pilar UM. Free radical scavenger and antihepatotoxic activity of Rosmarinus tomentosus. Planta medica. 1993;59(4):312-4. Adeyemi O, Sulaiman F, Akanji M, Oloyede H, Sulaiman A, Olatunde A, et al. Biochemical and morphological changes in rats exposed to platinum nanoparticles. Comparative Clinical Pathology. 2016;25(4):855-64. Wohaieb SA, Godin DV. Alterations in free radical tissue-defense mechanisms in streptozocin-induced diabetes in rat: effects of insulin treatment. Diabetes. 1987;36(9):1014-8. Tang K, Zhan J-C, Yang H-R, Huang W-D. Changes of resveratrol and antioxidant enzymes during UV-induced plant defense response in peanut seedlings. Journal of plant physiology. 2010;167(2):95-102. Marles RJ, Farnsworth NR. Antidiabetic plants and their active constituents. Phytomedicine. 1995;2(2):137-89. Baynes JW. Role of oxidative stress in development of complications in diabetes. Diabetes. 1991;40(4):405-12. King GL, Loeken MR. Hyperglycemia-induced oxidative stress in diabetic complications. Histochemistry and cell biology. 2004;122(4):333-8. Kawahito S, Kitahata H, Oshita S. Problems associated with glucose toxicity: role of hyperglycemia-induced oxidative stress. World journal of gastroenterology: WJG. 2009;15(33):4137. Baynes JW, Thorpe R. Perspectives in Diabetes Role of Oxidative Stress in Diabetic Complications. Diabetes. 1999;48. Yakimovich N, Ezhevskii A, Guseinov D, Smirnova L, Gracheva T, Klychkov K. Antioxidant properties of gold nanoparticles studied by ESR spectroscopy. Russian Chemical Bulletin. 2008;57(3):520-3. Shukla R, Bansal V, Chaudhary M, Basu A, Bhonde RR, Sastry M. Biocompatibility of gold nanoparticles and their endocytotic fate inside the cellular compartment: a microscopic overview. Langmuir. 2005;21(23):10644-54.